Un'antologia di dialoghi chitarristici compilata da Henry Kaiser scegliendo inediti e rarità tra gli archivi di quarant'anni di incontri con fedeli amici e personali eroi, tra cui Derek Bailey, Fred Frith, Nels Cline, Jim O’Rourke, Elliott Sharp, Eugene Chadbourne, Davey Williams, Bill Frisell e John Russell: Friends & Heroes: Guitar Duets (Fractal Music, 2017). 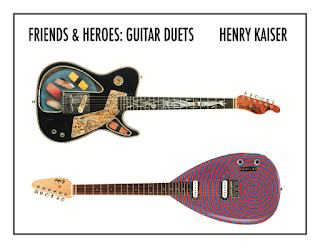 Spiega l'iniziativa Kaiser: "One of my most favorite recording and performing formats is the guitar duet. I have been fortunate to record with many heroes of mine, who became my friends; as well as with friends who have become heroes. That’s what’s being celebrated here. I have selected some unreleased tracks for this release, as well as out-of-print items from various ancient recording from my 40 years of album recordings."